Discharged Not amounting to Acquittal. Hassan Skodeng, who was charged last September for a satire he posted on his blog about Tenaga Nasional and Earth Hour, had a bit of good news this morning. He won't be making anymore Court appearances in relations to this case. [Read the good news H E R E]. Am glad common sense prevailed. Am gladder that I'm getting back the RM4k bail money. Yes, there were moments I thought the baboon might jump bail! Congrats Hassan. Long live humor! Hahahahahahahaha... Gambar pecah perut la..
HUrrah ... common sense prevail. SOmetimes it is not quite common. 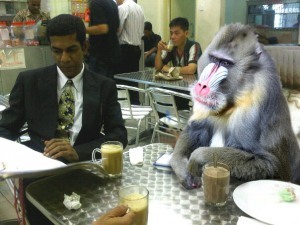 The kind of creatures baboons have to hang out with! But on the contrary, heard the Japanese welcome assistance from all the nations but refuse ours. Is it true ke? Why huh? 4K tu, ade duit bunga tak ? Justice has been done and Bro rocky gets his money back. Double good news. I say,"syukur,alhamdulillah".Nanti Hasan Skodeng buat kerja yang benar-benar je. p/s to Dato' - ada jeling tak kat JCorps?